NAZA TTDI Sdn Bhd plans to sell en bloc its remaining two office towers in the RM3.5bil Platinum Park development in the KLCC area in Kuala Lumpur. Group managing director Datuk Johan Ariffin said instead of selling piecemeal, the strategy now was to focus on en bloc sale given the current good demand for Grade A office buildings in the capital’s Golden Triangle. “We are targeting purchasers with very strong financial positions. By selling en bloc, we eliminate sales and funding risks and this will stand us in good stead in any future downturn. It will also put Naza TTDI on a stronger footing to ensure the success of Platinum Park,” he told StarBiz. On fears of an over-supply of condominiums in the KLCC area, Johan said the three high-end condominiums called Platinum Residences in Platinum Park would have only 265 units or a mere 4.4% of the estimated 6,000 units in the KLCC neighbourhood. Moreover, these condominiums catered to a very niche market where the residents would enjoy a private 1.5-acre park with 80,000 sq ft of retail space in Platinum Park. “We don’t believe there is an over-supply of condominiums in the KLCC as we are very niche. Not withstanding that, our current strategy is to side-step into a different market and that is to focus on selling our office towers en bloc. This will circumvent any downturn in the condo market,” Johan said. The two remaining office towers are of 50 and 38 stories. 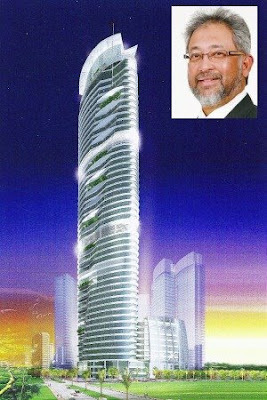 The first tower, a 50-storey Grade A building was sold to the Federal Land Development Authority (FELDA) for RM640.7mil or about RM900 psf when the company launched the Platinum Park on Jan 22 this year. 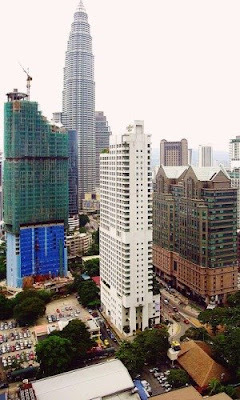 Named Menara Felda, it is about 700 metres from the Petronas Twin Towers and the Suria KLCC shopping centre. Johan said work on Menara Felda is in full swing and would be completed in 2011. “We have completed the diaphragm wall two weeks ahead of schedule and we’re hoping to complete piling three weeks ahead of schedule. We hope to call for the superstructure tender by the first quarter of 2009,” he said, adding that construction of the other two office towers should start early next year. “We feel we have a very strong advantage as Platinum Park is in a super prime location within the KLCC area where about 93% of Grade A office buildings are occupied,” he said. At the end of the day, people who owned offices in such locations would be in a better position to weather any downturn as offices in prime addresses would be much sought after, he added. “Our buyers can make more money than us. For example, we have got offers for Menara Felda for nothing less than RM1,200 psf but we told them that we have sold it to FELDA which has made a very smart move by buying the building from us,” he said. Platinum Park, a world-class high-end integrated residential and commercial development, will also have a five-star, 452-unit, 30-storey serviced apartment called Platinum Concierge Suites. The 80,000 sq ft of lifestyle retail space will feature international products and services never seen before in Kuala Lumpur. There will also be three levels of auto showrooms. Construction of residential projects in progress at KL inner city. Good demand for high-end and super high-end residential properties is offering a silver lining to industry players in an otherwise dampened housing market. Amid rising construction costs and a softening demand for bread and butter property products, developers are feeling the heat of squeezed margins and lower profits. Those with the acumen for high-end luxurious products are venturing into more of such products to meet their target sales and earnings projections. Industry players said the launch of more high-end properties, especially in the high-rise segment, has placed Malaysia on the radar of international investors. Exclusive developments with iconic architecture and designs have helped Malaysia move up the real estate value chain. The high-end and super high-end residential projects, which are targeted at high net worth Malaysians and foreigners, will not be much affected by the spiraling cost increases that are affecting a broad segment of the population. These luxurious residences, which are deemed one of the cheapest in the region, offer potential for good capital appreciation and yields. The positive environment in the country’s property market, including investor friendly policies and tax breaks, good infrastructure, easy access to financing and strong upside potential is raising Malaysia’s prominence as a real estate hub. According to Real Estate and Housing Developers Association president Datuk Ng Seing Liong, Malaysia still offers foreign investors low entry prices and good capital appreciation potential and the onus is on developers to augment the country’s good standing in real estate investment by offering quality properties to investors. “Projects that emphasise exceptional quality of life and designed with unique Malaysian characteristics to meet the needs of the savvy homebuyers, including the international community, should do well,” Ng told StarBiz. Popular locations for high-end landed properties have traditionally been Bangsar, Kenny Hills and Ampang, with new development concepts and price benchmarks cropping up over the years. Today, there are even super high-end landed residential properties with price tags of RM15mil to RM30mil a unit, or at RM3,000 per sq ft (psf). SP Setia Bhd’s Kenny Hills Grandé project in Bukit Tunku, Kuala Lumpur will be one of the most upmarket residential projects to be introduced in the market when it is launched at the year end. The 15 bungalows with average land sizes of 15,000 sq ft and built-up from 18,000 to 22,000 sq ft will be priced at RM30mil a unit. These trophy mansions with “colonial chic” architecture will set a new benchmark for the super high-end sector. “We are essentially offering the buyers an entirely customised and personalised experience in building their ultimate dream home in the most coveted address in Kuala Lumpur, minus all the administrative hassle. With a price that spells the pinnacle of luxury, we believe this project will appeal to the well-heeled and status conscious,” SP Setia group managing director and chief executive officer Tan Sri Liew Kee Sin said. Another interesting project is the enclave of 77 Bayrocks garden waterfront villas at the Sunway South Quay in Sunway Integrated Resort. Sunway City Bhd (SunCity) is pricing the 2- and 21/2-storey villas between RM4.5mil and RM7.7mil. Since the project’s recent soft launch, sales have reached close to RM140mil, SunCity managing director Ngian Siew Siong said. E & O Property Development Bhd marketing and sales director K. C. Chong said despite the current economic changes in the country, the company would focus on innovatively designed homes with outstanding architectural concepts and thoughtful layout, such as those in Seri Tanjung Pinang in Penang. “In Kuala Lumpur, we continue to place emphasis on premium homes located in prime locations, although we will have to ensure that we deliver these homes with the accompanying finesse expected of our projects. “In the current challenging times, we will need to look more at our design planning, be more innovative in terms of materials and finishes, and concentrate on the issues which are more important to our target markets,” Chong said. Meanwhile, response has been good for the new project launches in the high-end condominiums market, dubbed bungalows in the sky. Industry players said at current prices of around RM2,000 or US$625 psf, the super high-end products were still below benchmark rates of US$3,205 in Singapore and US$2,470 in Hong Kong, making them very attractive to foreign investors. Real estate consultants Knight Frank Ooi and Zaharin Sdn Bhd anticipate prices of high-end condominiums to hit a new high of RM3,000 psf this year as new products are targeting at a niche market driven mainly by foreign demand. “Interesting luxury projects that stand out such as the The Binjai, Millenium Residence, Four Seasons Place, and St Regis Residences in Kuala Lumpur could push benchmark prices to new highs,” managing director Eric Ooi said. The Regent Residences (across the Petronas Twin Towers), with benchmark pricing at an average of RM2,600 per sq ft, has been receiving good response from foreign interests, since its pre-sales in April 2008. The market also saw the entry of Sunway Vivaldi in Mont’ Kiara, setting a new benchmark in the Mont’ Kiara locality, with average pricing of RM850 to RM900 psf. The 228 condominiums with built-up of up to 4,000 sq ft are priced from RM2.6mil to RM6.3mil. Property consultants have mixed views on the high-end property segment amid the current tougher economic environment. Regroup Associates Sdn Bhd Christopher Boyd is cautious. “Generally the residential market in the Klang Valley has been weak this year, and will probably remain so for the next 12 months,” he told Starbiz. “At the top end of the condominium market (priced at RM350 per sq ft or higher), we see a general oversupply with 19,183 completed units and 13,902 under construction. “The greatest number of existing units and future supply is in the city centre including the Golden Triangle area,” he said. However, despite a very competitive market, Boyd said there was still turnover. “Investors looking for upward price correction should focus on areas such as Damansara Heights and Kenny Hills where there are very few high rise approvals and only a trickle of new condominium projects. “These are extremely popular and old established residential areas where occupational demand has always been strong and lettability should not be a problem,” Boyd said. “Over the next one year, prices will probably plateau in most areas for mid-upper products. Beyond that, it would not be surprising to see moderate gains as a result of cost push inflation, occupational demand, ready availability of end finance and a return of investor confidence,” he added. Alternatively, they could also embark on road shows in new markets such as Britain and Russia. Boyd advises investors to look for good value in the areas of Damansara Heights, Kenny Hills, Bukit Pantai, Bangsar and Ukay Heights. “A view to the Twin Towers enhances value!,” he said. According to VPC Alliance (KL) Sdn Bhd managing director James Wong, current demand for Klang Valley high-end properties remained robust due to limited supply and easy access to financing. “If Bank Negara decides to increase the base lending rate (BLR) to curb inflation, then this may put a slight damper to demand, otherwise, we think demand will continue to remain strong for some time,” Wong said. Currently, interest rates for housing loans are 0% to 2% below the BLR which is about 6%. ‘While there is an overhang in the mass housing market, supply in the high-end segment is limited owing to very niche development styles,” Wong said. The “hot” areas in the Klang Valley included the established developments of Desa Park City, Kuala Lumpur City Centre (KLCC), Bangsar and Mont’ Kiara, he added. KGV-Lambert Smith Hampton Sdn Bhd director Anthony Chua is not as optimistic as Wong. “From having a bullish outlook earlier on, we have turned cautious given the slow down in the economy. “We think there is now less excitement in the market and believe that property investors have been spooked by the recent events and are adopting a wait and see attitude,” he said. However, Chua opines that prices of high-end property will continue to hold at current levels, especially in “hot” areas such as KLCC and Mont’ Kiara. “The KLCC area continues to be on the radar of investors while Mont Kiara is catching up with it in terms of price,” he said. City Valuers & Consultants Sdn Bhd general manager C. Y. Lim said the demand for high-end landed properties such as detached, semi-detached and wide frontage terraced villas was steady in the high demand areas of KL and PJ. “These units are now being priced on the same basis, in terms of price per sq foot, as condominiums. Due to the greater demand compared with supply, their prices will continue to rise,” Lim said. For condominiums, supply has already matched demand and thus the price would consolidate and might even move lower with the exception of the “very best” units, he said. “This trend will continue until the economy starts to boom again and more expatriates come to KL,” Lim added. Tough times or not, property players are still going ahead with their high-end property launches. Ken Holdings Bhd executive director Sam Tan remains excited about the company’s exclusive Ken Bangsar project. Ken Holdings’s high-end service apartments Ken Bangsar, which averaged about RM1,000 per sq ft will be launched next year, Tan said. “Our outlook remains positive. We are still attracting a lot of interest from top end property market investors with our location at the top of Bukit Bandaraya plus the very high specifications fitted into the (Ken Bangsar) building,” he said. The project on less than one acre has over 80 units. As at May, more than 60% of the units have been sold. Mah Sing Group Bhd managing director and chief executive Datuk Seri Leong Hoy Kum is no less optimistic. For developers, it was a matter of good concept and product, location, branding and timing, Leong added. Mah Sing’s focus is on semi-detached homes and bungalows in the Klang Valley, as they account for only 5% of residential supply. The property company will soon launch properties under its middle to high end Residence series with units ranging from RM800,000 to RM1.5mil, as well as its high end Legenda series with units priced from RM1.5mil and above. “These are niche, gated and guarded developments, each with their unique selling points,” Leong said. It also has plans to launch Phase 2 of its Hijauan Residence project comprising 30 units of garden bungalows starting from RM1mil per unit by year end and Phase 3 comprising four-storey hill villas with an indicative selling price from RM2mil each next year. Located next to the Hulu Langat Forest Reserve, Hijauan Residence’s Phase 1 comprising 120 units of semi-detached and linked semi-detached homes have been sold out. “We are launching RM22mil worth of properties for Kemuning Residence in Shah Alam - some of them under the build-then-sell concept — in 2009,” Leong said. In Penang, Leong said the company had previewed 82 units of three storey super-link homes worth RM67mil at its Residence@Southbay. This is a gated and guarded scheme with its own clubhouse, and all 288 units in the development should be progressively launched over the next two years. “We also plan to launch our Legenda@Southbay, which comprises 76 units of three-and four-storey resort bungalows with built up from 5,000 sq ft to 8,000 sq ft, priced from RM2mil to RM5mil from 2009 onwards,” Leong said. Sunway City Bhd (Suncity) plans to launch its BayRocks Garden Waterfront Villas this year. It is the first phase of the Sunway South Quay project which is part of the Sunway Integrated Resort. Managing director Ngian Siew Siong said the 77 units were in the super high-end category with prices of RM5mil upwards and a gross development value of RM400mil. “The BayRocks Garden Waterfront Villa project is targeted for launch in the fourth quarter,” he said. and is a guarded and gated community facing the lake with an overall development concept based on horizontal strata in a low density development,” he said. He added that the high-end to super high-end segment still presented growth opportunities for the industry, as Malaysian properties remained attractive to investors, domestic and foreign. Although property prices were rising, they were still very much lower compared with mature markets such as Singapore and Hong Kong, where homes in prime locations were known to exceed S$5,000 per sq ft, he said. Developers are raising the bar in their product quality and designs to benchmark against the best in the region and the advent of expensive residences, including super high-end homes. They are also giving more credence to aesthetics, status and location. Other factors which dictate the qualification of a super high-end residence include spacious built-up, quality of finishing, façade, a posh feel, grandeur of the property, and of course the view. Buyers also place importance on considerations such as the reputation of the developer and consultants, accessibility, land tenure and status, unique features and layout, and property maintenance standards. Gamuda Land Sdn Bhd managing director Chow Chee Wah said the differentiating factors for winning projects include creative design concepts, top-notch quality standards, developer’s reputation and management capability. “There is also the prestige of being in the league of Kuala Lumpur’s most expensive addresses that attract buyers to these expensive residences,” Chow said. Knight Frank Ooi & Zaharin Sdn Bhd managing director Eric Ooi said with the increasingly competitive market conditions, developers needed to be more innovative in their product offerings. “For instance, 51 Gurney, located at Jalan Perumahan Gurney, Kuala Lumpur has attracted considerable foreign interest with its unique selling point of car lift system that allows residents to park their cars within their premises. This had led to its good sales performance of more than 35% within the first two weeks of launch,” Ooi said. Mah Sing Group Bhd president Datuk Seri Leong Hoy Kum said buyers of super-high end properties look for prime locations, good products in terms of concept and quality as well as good branding. “Super-high end properties tend to be close to iconic buildings or landmarks, and are served by good infrastructure, amenities and facilities. “Pricing would be a function of product and location. For example, condominiums in the KLCC areas with a good view of the Petronas Twin Towers would command a premium, as would condominiums designed by superstar architects and developed by branded developers,” Leong said. Investors would also look at the potential for capital appreciation, rental yield, branding and the reputation and track record of developers. E & O Property Development Bhd marketing and sales director K. C. Chong said in the current market conditions, buyers would be more selective, preferring location, developer’s reputation and development concept before committing. “Seasoned investors will invest as they are likely to consider these purchases as prudent investments and a hedge against inflation, particularly given the rising costs of building materials. “Purchasers may consider smaller investments, hence smaller condominiums and service apartments catering to specific niche markets will be popular,” he said. Chong said E&O’s St. Mary’s serviced apartments that comprise luxurious one and two bedroom apartments designed with great flair and services would suit the international businessman. Landed properties and gated homes within the city limits will continue to be popular although the supply may be limited due to scarcity of sizeable tracts of prime land. Meanwhile the popularity of residences in chic addresses in the centre of the capital will continue to fuel the rush for KLCC developments as seen in the rising prices. The first two high-end condominiums in the KLCC area - Stonor Park and 2 Hampshire - launched in 2003 and 2004 respectively, have seen their prices doubled to RM1,000 and RM950 per sq ft respectively. Other condominium projects that were launched after that have breached those levels while the prices for projects under construction have gone even higher. Troika residences are going at average prices of RM1,800 per sq ft, Ampersand at RM1,450 psf, One KL at RM2,000 psf while the Four Seasons Place residences will most likely breach the RM2,000 to RM3,000 psf level. Is this possible given that many developers these days are struggling to launch new projects not to mention completing existing ones with soaring construction costs and sluggish sales? Naza TTDI Sdn Bhd group managing director Datuk Johan Ariffin has the facts to show that it is not empty talk - the company completed the 350,000 sq ft Giant hypermarket in Shah Alam in six months in 2001, a Malaysian Book of Records Achievement. It delivered Phase 1 and 2 of its Jayamas shop offices in Shah Alam 20 months ahead of schedule and it is 15 months ahead of schedule for The Residence condominium in Taman Tun Dr Ismail. It also completed the TTDI Plaza shop offices and the Laman Seri bungalows and semi-detached units a year ahead of schedule. “Naza TTDI has been at the forefront of property development since 1973. Being one of the leading players in the industry for over 35 years, the company has earned the distinction very few premier property developers have, that is the consistently delivering quality products ahead of schedule,” Johan said. He added that purchasers would not have to worry about time delays and other costs associated with delayed and abandoned projects. “Projects that are delivered ahead of schedule will give buyers significant savings in progressive interest amounting to thousands of ringgit. Our purchasers can also move into their units earlier thus saving on rental or if they are purchasing the properties for investment they will enjoy earlier rental income,” he said. “We are relentless in our pursuit of quality. We have a technical team that is responsible for ensuring daily quality control and an independent quality assurance team that conducts regular checks to ensure quality is up to the mark.” All contractors are briefed on the company’s strict quality benchmarks before they are awarded projects. “We also adopt the Construction Industry Development Board’s QLASSIC standards and subject our projects to their audits and scoring. We are also ISO 9001/2000 certified and are audited by SIRIM for strict compliance of the quality management system,” Johan said. He said buyers were increasingly discerning and developers were taking note of their demand for quality. “We believe that purchasers will single out companies that are sensitive to such needs and that have policies geared to deliver quality. Such quality focused developers should do well in the future as their products would be much sought after due to lower incidence of defects and delays due to defect rectifications,” he said. Such stringent controls would result in higher construction cost, as contractors would have to price in for better quality and shorter completion period, he said. “However, we help to minimise such cost increase by pre-qualifying contractors and making prompt payment on progress claims. There are even instances where we can actually purchase materials at more competitive prices than our contractors. It is more a question of networking and managing logistics. If done well, the cost can be controlled,” he said. FAR East Consortium International Ltd, a Hong Kong-listed hotel and property group, may sell Malaysian assets valued at over RM1 billion to a real estate investment trust (REIT) next year. Sources said that pending favourable market conditions for a listing, the group is looking to buy more hotel and shopping complexes to be injected into the trust. "They are getting the properties ready for listing ... but it will not be listed under current market conditions," a source said. It is understood that due diligence on a majority of the properties that will be placed under the trust has been conducted. "There is no rush to list the REIT. They are looking for more properties to be added to the REIT. Listing could be next year," the source told Business Times. Far East has also delayed the listing of its planned REIT in Hong Kong, comprising seven hotels, to raise HK$4 billion (RM1.8 billion). Despite a more favourable listing environment for REITs in Malaysia, announced during the tabling of Budget 2009, it is believed that Far East is still undecided whether it will list on Bursa Malaysia or Singapore Exchange. It was reported that Far East would include its properties and possibly even one property owned by Malaysia Land Properties Sdn Bhd (Mayland). Far East and Mayland have a common shareholder in Tan Sri David Chiu Tat-cheong. Chiu is the deputy chairman of Far East. Far East may sell Malaysian properties such as the four-star Dorsett Regency in Bukit Bintang, Kuala Lumpur, the five-star Sheraton Subang and the Grand Dorsett Labuan Hotel (previously known as Sheraton Labuan). The recently completed Maytower Hotel Serviced Apartments and its new hotel in Johor Baru will also be part of the trust. The existing hotels are said to be valued at about RM500 million. Mayland's Hartamas Shopping Centre in Kuala Lumpur, which may be included into the REIT, could add another RM400 million to the size of the property trust.